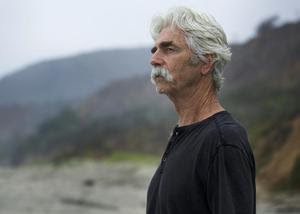 With a iconic voice and a epic mustache, the ever enigmatic Sam Elliott (Tombstone, Ghost Rider, The Big Lebowski) dons a character that fits him and is a little too close for comfort. He plays Lee Hayden a washed up western film/voice actor that takes out a new lease on life. Making ends meet with any roles he can get his hands on, he isn't exactly happy with the way his life is going. With the news that he has terminal cancer he becomes introspective and seeks advice from others and his long time buddy/pot dealer Jeremy played by Nick Offerman (Parks and Recreation, Axe Cop). A complicated and distant relationships with his ex-wife Valerie played by in real life wife Katharine Ross (The Graduate, The Stepford Wives, Donnie Darko) and daughter Lucy played by Krysten Ritter (Jessica Jones, Big Eyes) hangs on his head, and with time now a luxury the urge to mend it dwells on him. While visiting his buddy to buy more weed, a intriguing woman arrives played by Laura Prepon (Orange is the New Black, That 70's Show) to buy from him too. After running into her again they spark a intimate relationship that is strange and new for both of them. With all this going on he debates the reasons to keep on living or to just give up. Sam Elliott as an actor has been pretty much been pigeonholed to a certain character (western badass) and in this film he definitely takes a chapter from his own life to play this part. The mundane feeling you get when he has to repeat a slogan from a barbecue sauce voiceover commercial he repeats over and over and over again seemed all too real. He gives the character depth that I don't think any other actor could do, definitely this part was written for him. Laura Prepon has the maturity for playing a winter/summer relationship to be believable and taken seriously not mention they definitely made a cute couple. When they were in a love scene together there was such a artistic eye, the contrast of his weathered tan skin against her blemish-less porcelain skin was quite beautiful. Focusing on how different they were but still so much alike at the same time. I had a connection to Krysten Ritter's character, she played the part with such honesty that I saw myself in her. The definite comedy relief was Nick Offerman giving the audience a release from such a heavy subject matter. Showing the inner workings of a male plutonic relationship, by being there for him even if they don't have deep conversations no words are necessary for a true friendship. At times the cinematography got very psychedelic (well he was on drugs) with scenes that just let the mind wander, with beautiful California scenery you can't help be in awe of it all. This one is absolutely a keeper in my book, if you ever had any family that dealt with cancer I advise you to bring some tissues because you will cry like a baby. My Hope Is that Sam Elliott does more leading roles like this and keep expanding his repertoire this one is definitely worth the ticket.